At JD Physio Services we aim to provide the highest standard of evidence based and personalised physiotherapeutic assessment and treatment for musculoskeletal and neurological conditions. Our motto is not only to provide treatment to help improve your heath condition, but also to educate and assist in preventing the recurrence of the problem. We understand that patients have varying needs and aim to provide a high level of service both at our clinic and in the privacy of your own home. 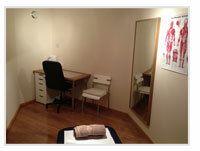 Musculoskeletal physiotherapy is the treatment of muscle and joint conditions. 2. Improve your flexibility, muscle strength and quality of movement. 3. Provide you with strategies to best manage your injury or condition. 4. Help you to recover quicker and hasten your return to your normal activities. 5. Help you to prevent future injury recurrences. Neurological Physiotherapy is a ‘hands on’ treatment aimed at maximising the functional potential of the neurologically disabled patient. Neurological disorders are those affecting the brain, spinal cord and nerves; such as stroke, Multiple Sclerosis and Parkinson's disease. Physiotherapists assess the patient’s specific movement patterns, balance and strength and develop a treatment plan to focus on enhancing or maximising functional ability and improving quality of life. Copyright © JD Physio Services. All rights reserved.